We were leafing through old newspapers from the 1950s when we ran across (then) Vice President Richard Nixon’s favorite chili con carne recipe. We’ll leave the whys and wherefores of Nixon’s political career to civic historians as we’re only in it for the chili. 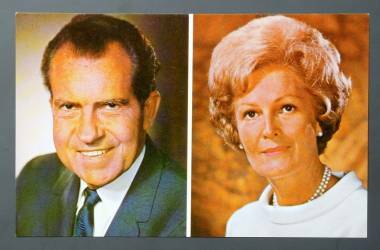 Back in the 1950s, Pat Nixon, Richard’s wife, ran her family’s kitchen, did all the cooking, cared for the affairs of the household, and also sewed garments for the couple’s children Patricia and Julie. When we struck out for Washington DC when we were small children our grandfather’s only request was to ‘bring home a color photo of Nixon’ which we managed to find in a gift shop at the Smithsonian. We’ve been on a serious ‘presidential chili’ kick lately and former president Richard Nixon’s is a good one. Apparently his time spent under President Eisenhower (a native Texan) did not cause a disdain for beans as red kidneys are a prime ingredient in the California native’s formula. Soak beans over night in cold water. Cook beans in boiling salted water until tender. Drain well. Brown meat, onion and green pepper in hot fat. Add tomatoes and seasonings. Simmer slowly for about 2 hours. Add water if necessary. Combine with beans and heat thoroughly.